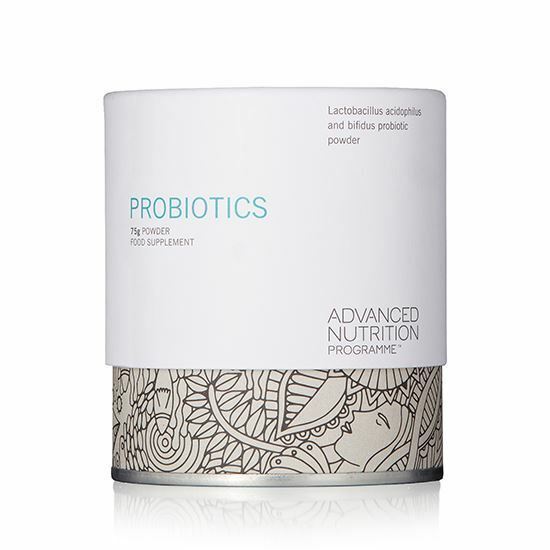 PROBIOTICS | iiaa Ltd | The UK and Ireland distributor of Environ Skincare, jane iredale makeup and Advanced Nutrition Programme. INGREDIENTS: maltodextrin, Lactobacillus acidophilus (stabilisers: ascorbic acid, lemongrass, glutamines), Bifidus infantis, Bifidus longum, Bifidus brevis. NO ADDED: salt, soya, yeast, lactose, dairy products, artificial preservatives, colours or favourings. Probiotic bacteria are grown on dairy derived ingredients. DIRECTIONS: Adults and children take ¼ to ½ level teaspoon a day, with water, juice or sprinkled on cereals, or as your health professional advises. Children under 2 years; half dose. Store in a cool, dry, steam-free environment as damp conditions can affect the product quality.